I recently went to see Rihanna with my boyfriend in Cardiff at the Millenium Stadium for her Diamonds World Tour. One of the things I was most looking forward to seeing was her outfits for the evening for each leg of the concert. And she didn't disappoint. My favourite outfit was this orange skirt and crop top combination. A few days later I went to London with my friends and found this orange maxi dress in Forever 21 for a bargain £12!! It reminded me of Rihannas outfit in a more wearable way. I didn't even realise it had the slits up the side until I tried it on at home. Add a sparkly necklace and sweep your hair to the side and you're ready to go. After reading a few blogs about vintage kilo sales I decided I wanted to try it myself. So me and a couple of friend took the train to London and made our way to Hackney Down Studios on Friday afternoon. The idea is simple, you look through the crates of clothing, pick out the items you like, take it to the counter where it will be weighed and pay £15 per kilo. I have to say, I am not overly keen on searching through bundles of clothing. I am quite lazy and like things laid out nicely for me. But I must admit I found this quite fun. It was exciting looking through the boxes wondering if there would be anything there for me or not. Me and my friends split up for 5 minutes and when we saw each other again we all had armfuls of clothes and bags. Depending on the weight of the item you picked and if it was a bag or clothing you can get about 4 items for £15, this is a bargain even for Primark lovers. Alongside all the clothing you can get, Victorias Vintage was also there with masses of beautiful jewellery and accessories. You can pick up such a bargain here, finding on trend pieces for half the price. I would definitely be interested in going again, but I think I would get there for the opening as I did find that a lot of the boxes were slightly empty by the time me and my friends got there, even though it said on the website they were refilled regularly. Anyone who likes to find a bargain, likes to do something a little different and also likes to find unique clothing should definitely put the next dates in their diary. I've been in a bit of a rut with my make-up lately, wearing the same things everyday! So I challenged myself to wear one different thing everyday for a week and I've fallen in love with a blush I had forgotten about. MAC Peachtwist is a darker peach colour with a shimmery gold finish. Even though its supposed to be a sheertone colour, you have to be easy with the brush as its really pigmented. I have quite rosy cheeks anyway so I normally stay away from darker blushes, but I just love the colour. I think this colour is definitely worth a look if your looking to invest in a new blusher! Ok so I got a little crafty over the weekend and decided I wanted to make a pinboard for my bedroom so I could have an 'inspiration' board. Naturally I wanted it too look as pretty as possible so I took to pintrest to get some ideas and decided I wanted to make a fabric covered pinboard. And heres how I did it. Cut your wadding so that it is the same size as the front of your pinboard and staple into place. Take your fabric and place it directly over the pinboard and wadding. Fold the left side over the wadding and staple it to the back of the pinboard all the way down. Fold the corners that are lose so they are flat and staple them down. Take your ribbon and decide how you would like it placed. You can do all sorts of patterns e.g. criss cross. I decided to cut 4 strips and place it in the four corners, stapled down, and hey presto your done! Whether your a fan or not, the colour of the summer is white. I literally cannot turn around in a shop lately without seeing a white item of clothing. Now I'm no Rosie Huntington-Whiteley in Transformers, who pulled off every white look she wore, and being so pale, I often try to stay away from anything white. It just doesn't flatter my skin type. 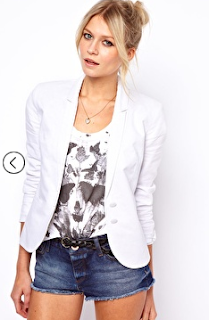 But lately I've found myself lusting after a white blazer. 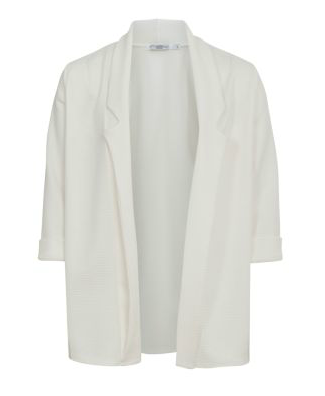 I think this would be the perfect way to wear the trend for all skin tones because you can use a bright top underneath to tonne down the white. Here's 3 options I've been looking at lately. So wat do you think, should I save, spend or splurge?